Elaine Hancock (Olney, United States) on 15 March 2017 in Animal & Insect. Bluebird in the snow. We did not get the predicted big snow. It only added up to about 3 inches (7.62 cm). It wasn't one of the prettiest snows. It didn't stick to the trees, but I was able to work on taking bird pictures! Oh, what a very pretty and lovely image ! All the best for you Elaine. Beautiful capture, cute little bird. Wow, what a combination !! Just a little snow but a beautiful bird and a wonderful photo !! These are such pretty little birds. We didn't get much snow here, but lots of wind. Gorgeous bird and what a beautiful wintery photo, superb ! 5 stars from me. SPectacular! 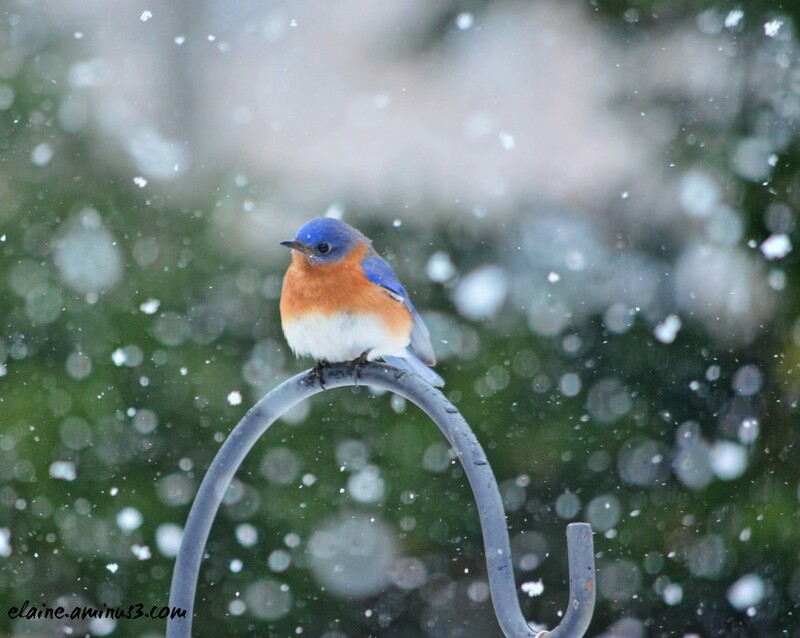 I like the puffed up blue bird who looks warm and comfortable despite the snow flakes. How sweet, and how beautiful! This little fellow appears a bit hapless in the snowy surprise! Glad you weren't snowed under, as you might have been. Fantasitque rendu sur son plumage et cette eau projetée sueprbe. Lovely bird. I think, it's better for you if you didn't have 10 inches of snow. Ohh !! OUTSTANDING IMAGE !! I like a lot ! A beautiful capture of this small charmer. The snow worked well for you here. It makes a lovely backdrop to this little Bluebird. So cute ! Wonderful capture of the beautiful bird. Looks cold.